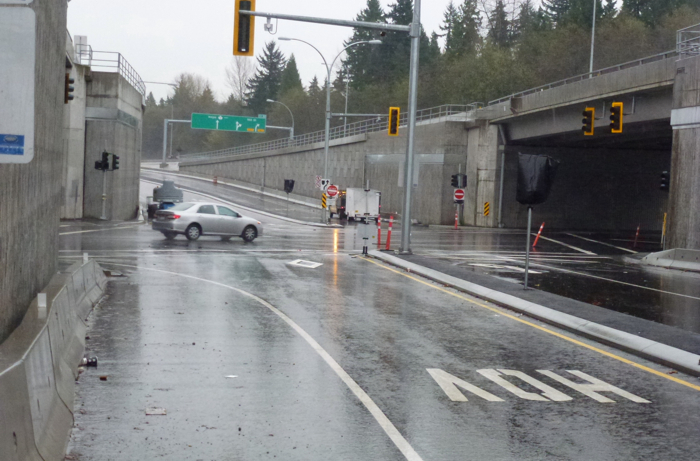 The Clark government has decided that the George Massey tunnel need to be replaced, why? 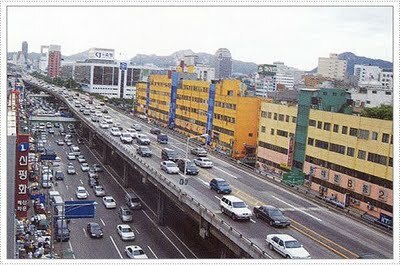 Of course, but how congested is the tunnel (see our bridge traffic post for more context)? 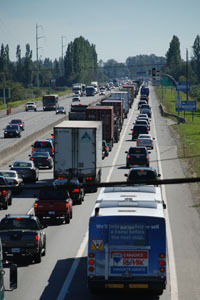 Why we should build a new infrastructure, in the name of keeping the Deltaport truck traffic moving when this traffic could be easily shifted during non congested hour? The rather limited current Deltaport hours of operation is not allowing this today , why not change that? 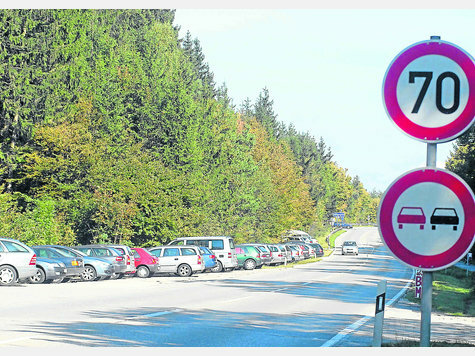 population growth will make the tunnel congested in the future anyway? But why people see it differently? 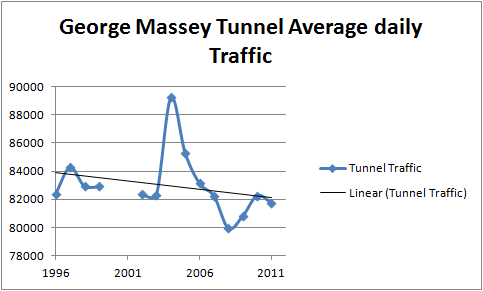 In light of the above, one must asks: Is the George Massey tunnel replacement the best we can do to improve the lower mainland traffic? The Clark government seems already have made his mind on it, but where are the studies and analysis supporting the replacement choice? 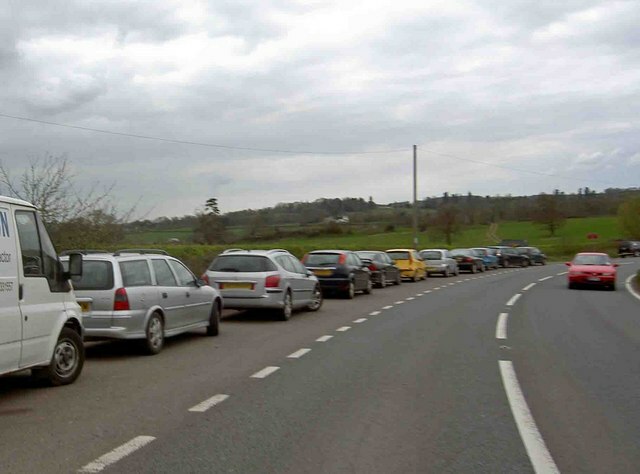 Is building more road the way to alleviate congestion? Is it some other solutions? 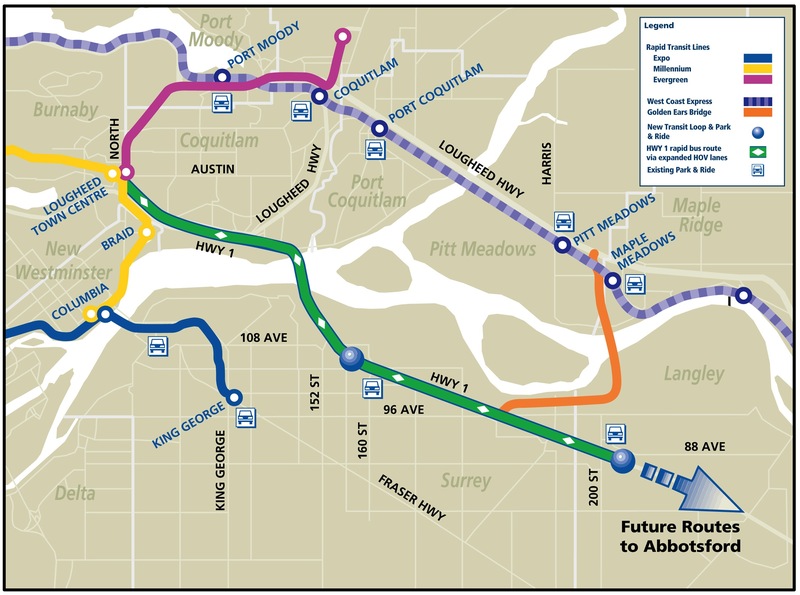 First, Translink needs to recognize that not all people are heading to downtown and has to provide a larger access to Vancouver from south of the Fraser. 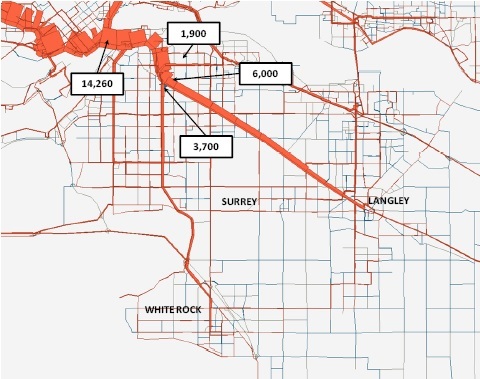 A suggestion already made in a previous post is to extend most of the North South Vancouver bus route to either Marine Drive or Knight Bridge. 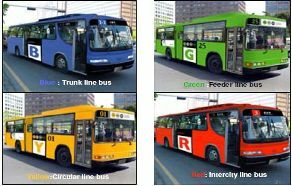 A comprehensive network of regional bus line is necessary to attract long distance commuter. 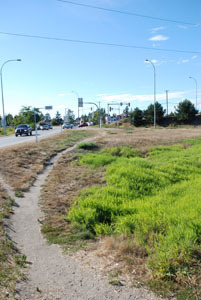 That is the trail, wet and muddy in winter, dry and dusty in summer, to reach the SB Hwy 99 bus stop at Steveston! Lastly, when the service level is objectively good, people need to know it. 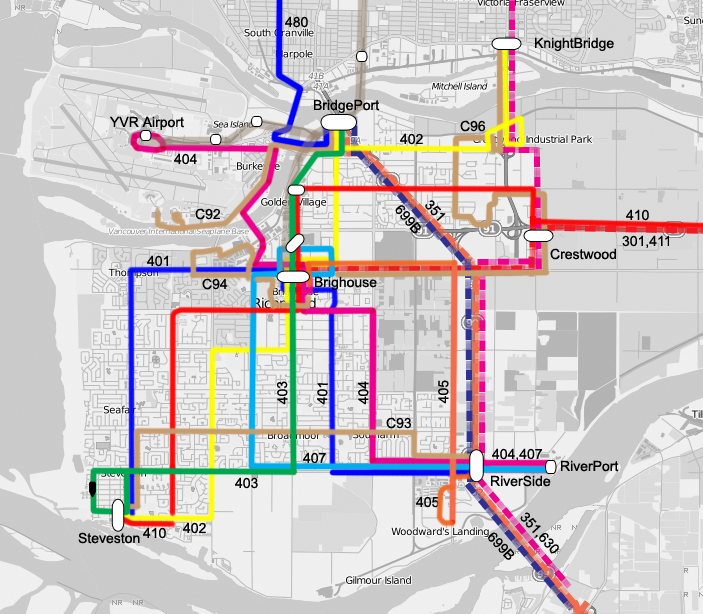 Branding is important as we have already seen with the suggestion of code sharing to create a B #699 line between Ladner and BridgePort, leveraging the existing #601 and #620 routes. a well branded bus toward the customer base. 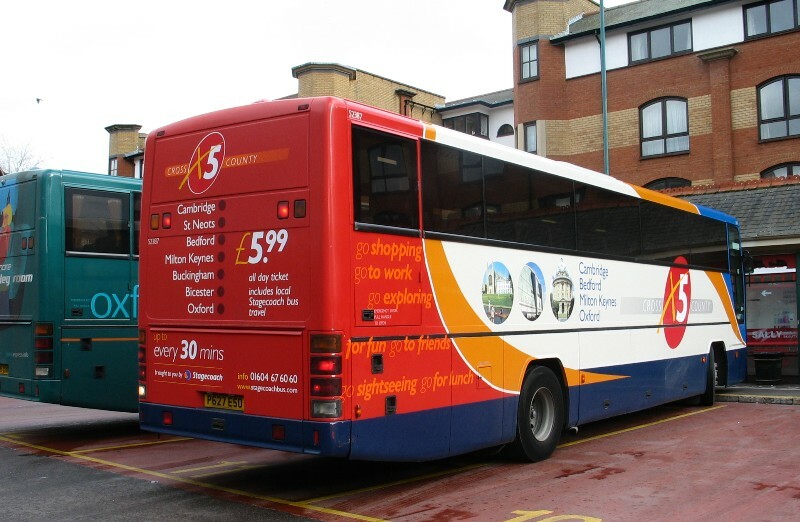 a driver following this bus can’t really ignore where it is heading, at what frequency, where it stops and how much it cost. 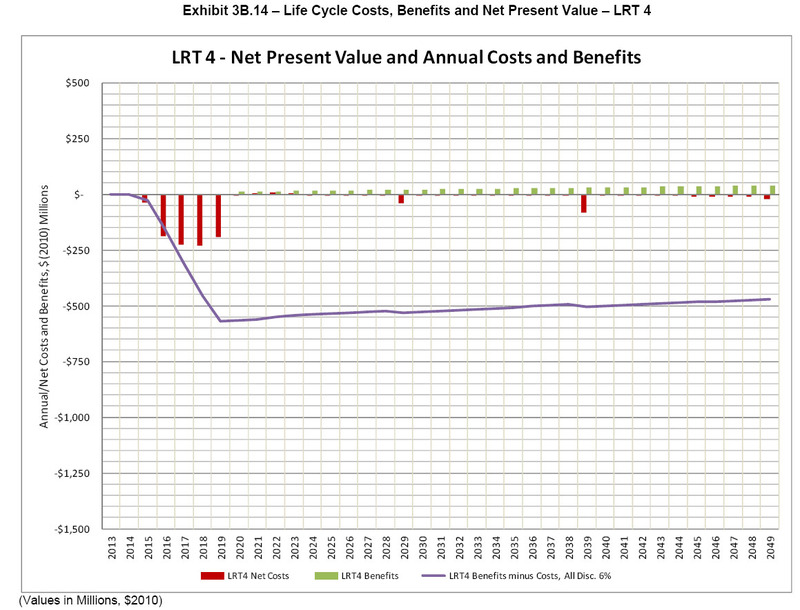 What is the cost of congestion in the tunnel? Phenomenal will tell some…some more substantiated studies will tell at which level a toll needs to be set to avoid congestion (That is the real economic cost). 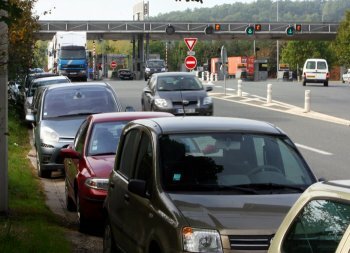 In the case of the George Massey tunnel, it is at a level such that the congestion toll need to be in effect not much more than 5hr per day, and could rise only $46 millions  as we have already seen in a previous post. The first solution needs 10 years time frame to be implemented and doesn’t resolve transit funding issue. 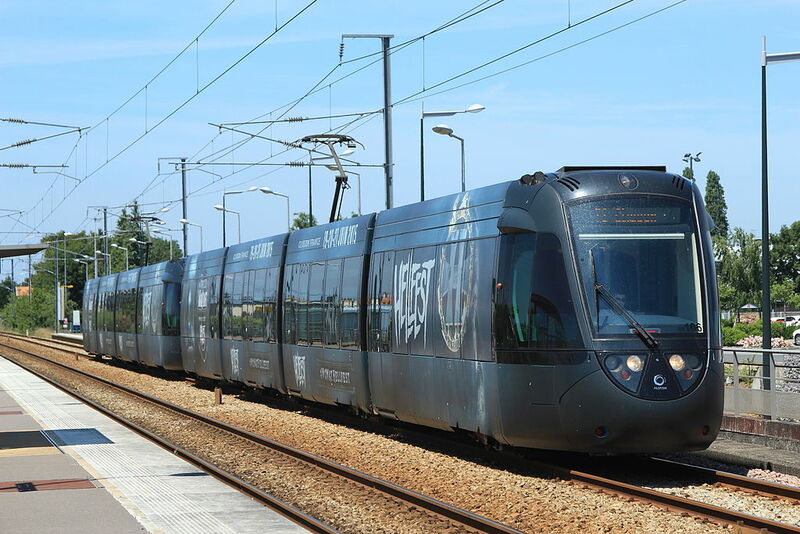 The second solution, which doesn’t preclude the first one in due time , can be implemented overnight and resolves the congestion issue now as well as provide transit funding. Which alternative is the best? 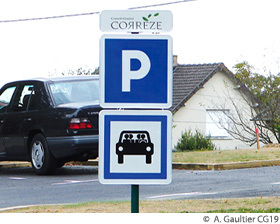 We humbly suggest that the best alternative is the one requiring the less tax-payer and user fee money. On the later, some rumors suggest that the presence of the tunnel is limiting the possible amount of marine traffic, due to draft restriction. 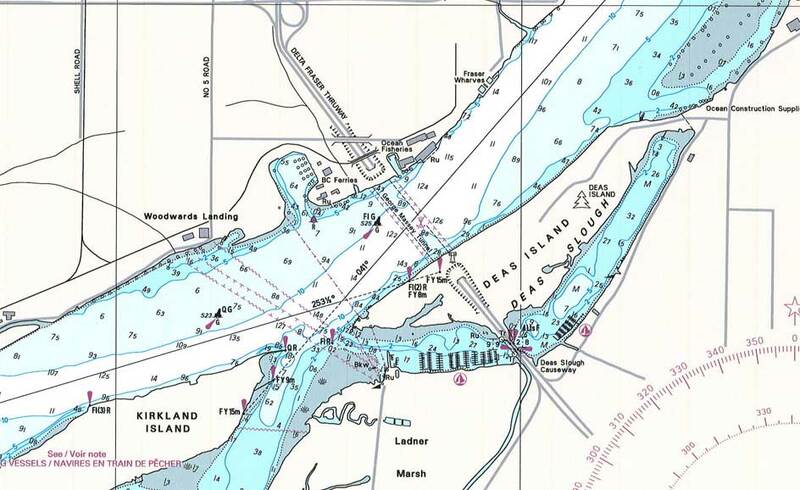 The Nautical chart of the Fraser river tell another story. 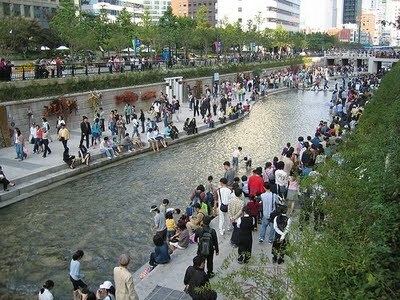 In fact the depth along the channel is around 11 meters, 12 meters above the Tunnel. 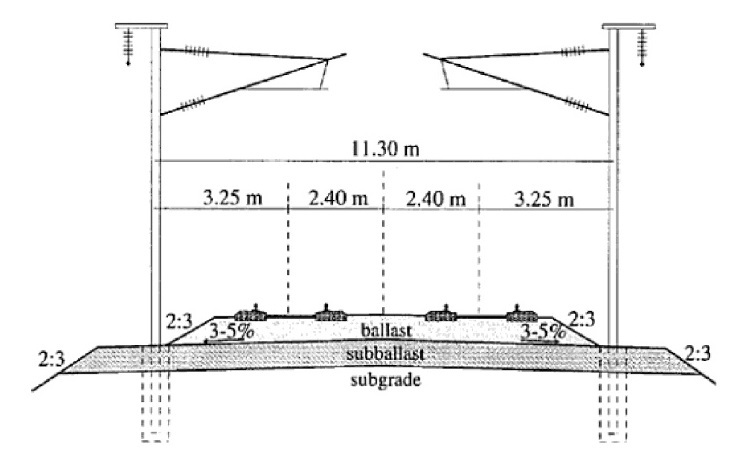 The nautical chart doesn’t show the tunnel location as being the shallower point of the channel, in fact opening the channel to greater draft ship could require considerable dredging of the whole channel. Allowing ships with greater draft than allowed now could require considerable dredging of the Fraser channel, from the Stevenson jetty far end to East of the tunnel, as well as significant on going maintenance, due to constant build up of sandspit. That certainly has a non negligible ecological cost as well. 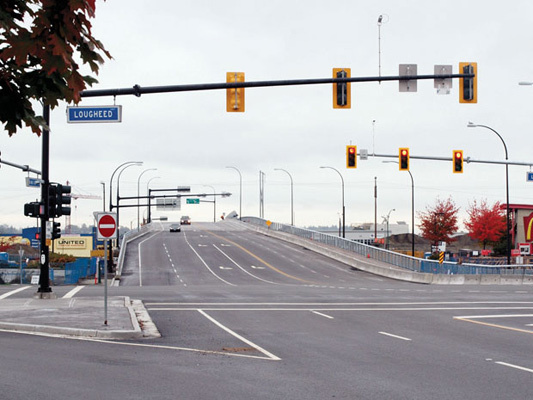 The economic rational of this is pretty unclear, and we notice that around the world, ports don’t seem to develop operation inland…beside barging (option here restrained by the railway bridge at New West)… since not all ports can count on a government building road for free to them. Highway 99 corridor assessment, draft v.1.5, Januray 2009, BC Ministry of Transportation and Infrastructure (report got thru civicsurrey.com). 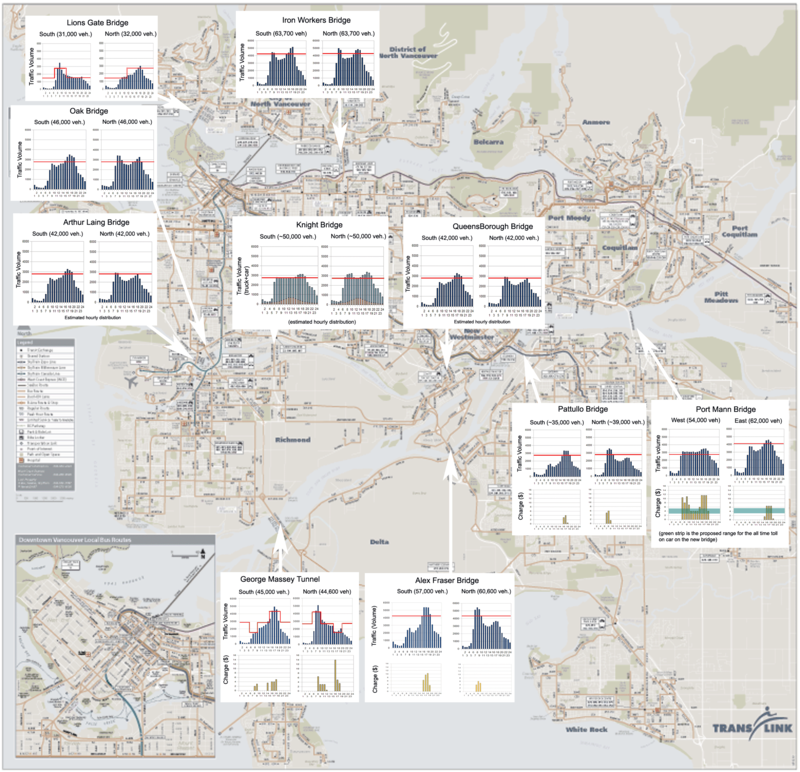 Notice: thought the transit numbers of this report pre-date the advent of the Canada line, they are based on a bus count (36 in peak hour/direction), which is the same as of November 2012. For a Richomnite, it can be a challenge to get to the airport, involving in most of the case not less than 2 transfers (typically one at Brighouse and one at Bridgeport). 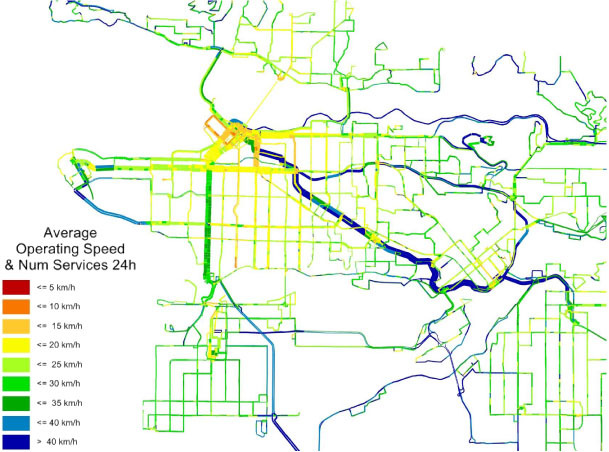 The network could also take a more decisive advantage of the choke points surrounding Lulu Island. The proposition hereafter aims at correcting those issues, and we examine in this post the regional view first. 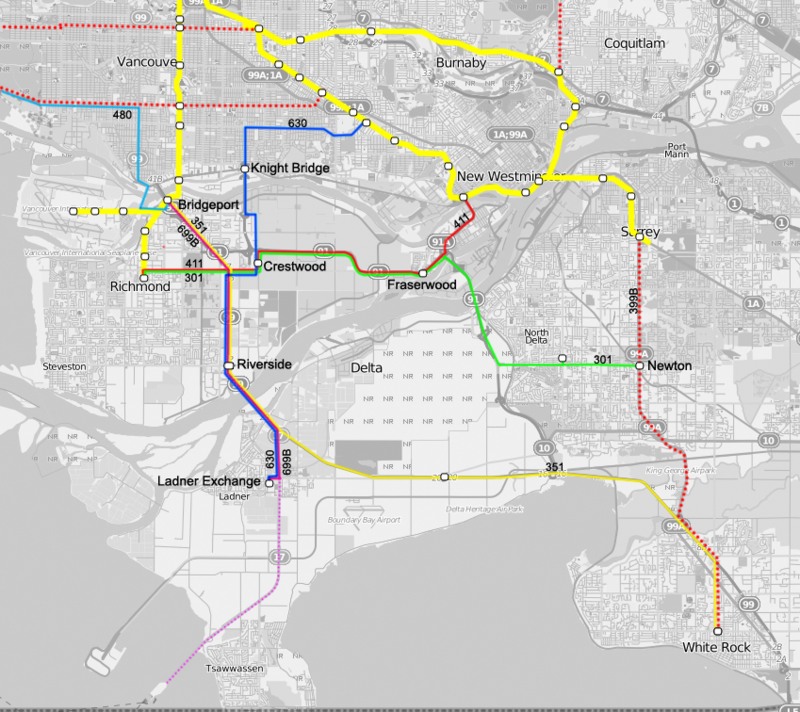 The 630, starts at Ladner park and ride exchange, to connect with local shuttle route here, and proposes the service as an alternative to alleviate traffic queuing at the George massey Tunnel. 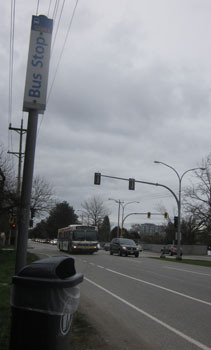 The 630 stops at Riverside (Hwy99 at Steveston Hwy), providing a good connection with the South East richmond network (401, 403, 404, 405 and C93), and also at Crestwood, where it offers potential connection with regional route 301 and 411 as well as local route 410, and C96, opening new access for people coming from south of the tunnel. 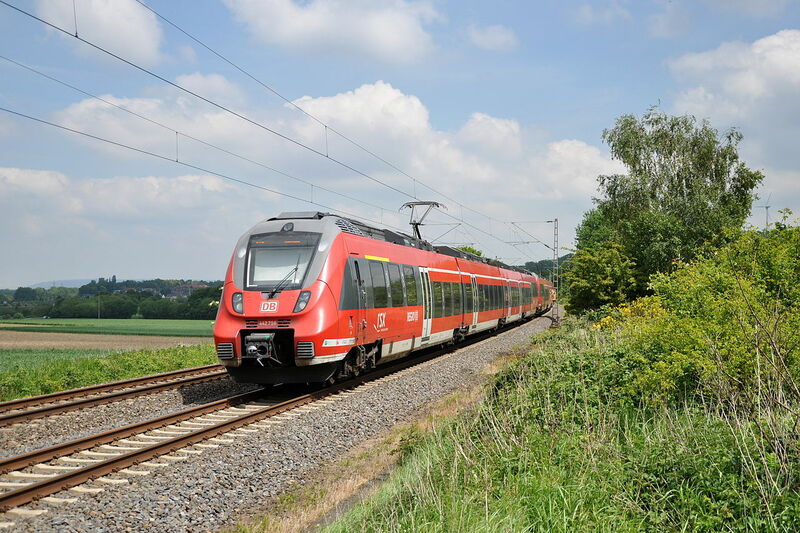 One would like to see the 630 service provided by highway coaches, since the patrons boarding this service are still aiming at a relative long journey. 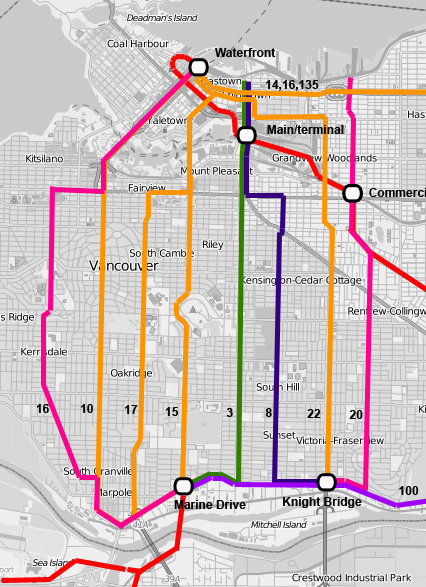 One will also notice that the combination of route 301 and 411 can provide an express service between Queensborough (Fraserwood) and Richmond every 10mn.